Sue's Movie Review--Meryl Streep and "The Iron Lady"
Why, oh why, couldn’t they give us a movie about British Prime Minister Margaret Thatcher that was as good as Meryl Streep’s superb portrayal of her in “The Iron Lady?” Instead, we end up watching one of the greatest actors of this era spend too much of this film shuffling around half-tipsy in a housecoat and slippers. Mrs. Thatcher is seen in the last years of her life having conversations with the ghost of her late husband, Denis. These are scenes that the real Maggie Thatcher would have no doubt deplored. One wonders if a male Prime Minister, historically ranked just below Winston Churchill, would have his story told quite this way? 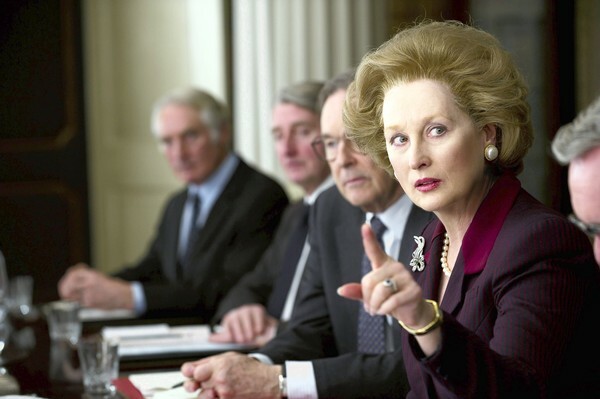 There are significant lessons about women and power that the life of Margaret Thatcher has to teach us, but unfortunately, the film doesn’t really develop them. It presents Thatcher as a woman who defined herself through the men in her life: her father, her husband, her colleagues in the Conservative Party, and finally her errant son. It also shows us the formation of her indomitable will, tempered by the British struggle during World War II and her desire to rise in the class-defined society of mid-century England. The audience follows Thatcher’s arduous path to success. A teenaged Margaret is seen suffering the taunts of wealthier schoolmates as she tends the family store and embraces her proud father as he reads her acceptance to Oxford. (She matriculated in chemistry.) She runs for local office and meets the man who is to be her husband and biggest supporter, Denis Thatcher, a successful business man. After that point in the story, Streep takes over the movie and gives a tour de force performance, literally inhabiting Thatcher’s skin. The IRA bombing of her hotel room is a particularly unforgettable scene in which both Thatchers nearly lose their lives in the kind of senseless violence that plagued Britain at that time. 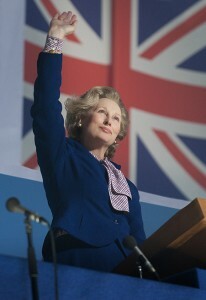 It is at that moment when Streep shows us that even the great Iron Lady herself had doubts. 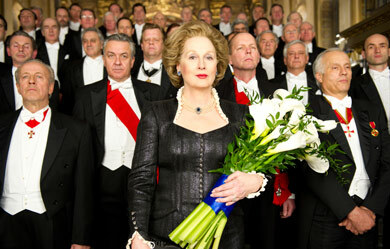 Without a word, Streep’s Thatcher asks, “How can I go on? Will I be allowed to go?” Perhaps despite all of her confident composure, Margaret Thatcher was never quite sure. Like Ronald Reagan (a man she admired and of whom she was genuinely fond), Margaret Thatcher took control of a country that was in poor shape. Its economy was weak and morale was low. Just as Reagan did, Thatcher stood up to the unions, cut the social spending budget, hanged tough on increasing social programs, and tried to restore national pride in a way that harkened back to earlier, happier times for the nation. Some of her plans worked and some of her plans didn’t. At times she was vilified and at others celebrated, as in the aftermath of the British victory in the Falklands where she stood firm. We see Mrs. Thatcher valiantly struggling to get into the “old boys club” of the British Parliament, and it gives us a moment when we’re really rooting for her. 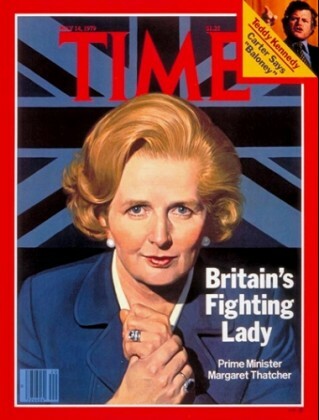 But where the movie breaks down for me and where I lose sympathy for Mrs. Thatcher is that she did not seem to be a female leader who put other strong women in politics on a par with herself. She believed she achieved her extraordinary success because she was an extraordinary person. However, her thinking did not go so far as to embrace the idea that other women might be able to achieve the same thing if they were given a better chance. Politically, she abhorred programs that were handouts, but she also didn’t much care for extending a hand up, boosting an equally qualified person on the ladder rung below. In fact, while she was in office, Margaret Thatcher cut subsidized child care for working women. That Thatcher identified solely with her father and preferred the company of men over women is made clear, but the consequences of this are never shown. A female dinner party guest pays homage to the aging Mrs. Thatcher on behalf of all the women of her generation. In reality, neither the women’s movement in this country nor her own gave her the accolades one would think she earned. In fact, feminists are quite divided about Margaret Thatcher because of her conservative policies which some felt hurt women. As a prime minister appalled at the way cabinet decisions are were made, she states: “When did feeling replace thinking? Today, it’s all about what people feel.” Indeed. 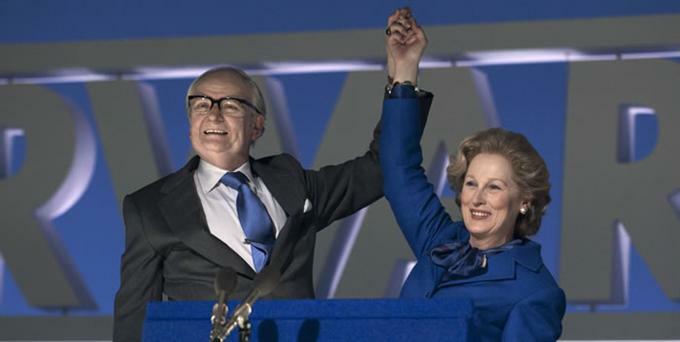 As her Conservative Party stalwarts betray her at the end of the film, Mrs. Thatcher laments that it was she who was forced to make the hard decisions alone. She had grit, determination and precision as she blazed a lonely trail, which could have included many more women by her side if she had reached out and mentored them. 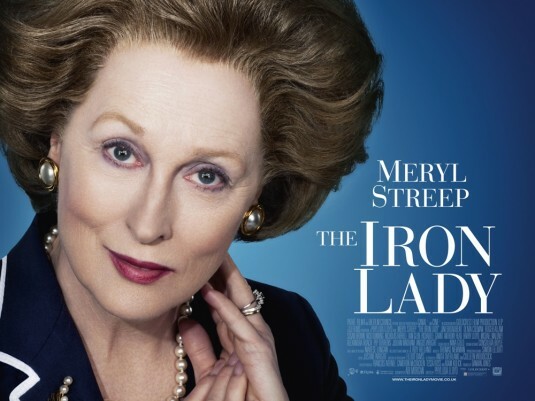 All that said, it is not surprising that the marvelous Meryl Streep has received her 17th Oscar nomination for her portrayal of the Iron Lady. She delivers a powerful performance with technical perfections, and tightly controlled emotion. After all, public displays of emotion were not Margaret Thatcher’s calling card. It was her fierce will and tenacity in the face of harsh criticism and downright disaster that made her extraordinary, and Streep conveys that perfectly. As they say, she really nails it, even though the overall movie does not. And this is one of Streeps best performances, and that’s saniyg something. I feel like she is either taken for granted, or even dismissed like: Oh, there’s Meryl Streep, being great again, whatever This has been a groundbreaking career. Other women of her generation are still struggling although Diane Keaton has had a beautiful resurgence and is also playing leading lady parts still. But Goldie Hawn. Where is she? Susan Sarandon should still be playing leads. There just isn’t enough stuff out there. Older women are seen differently than older men. Especially if we once knew these older women as young and beautiful: nobody wants to see them grow old. Streep is changing all that, and she’s been doing it by stealth.